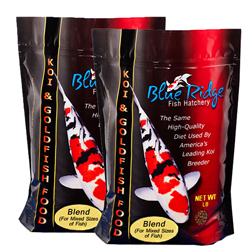 Blue Ridge Blend (Mini and Large Pellets) Fish Food This diet is simply a mixture of the mini and large pellet growth foods. Designed for pond owners with mixed sizes of fish in their ponds. Packaged in two, five and twenty five pound bags.